We have vacationed with a group of Clemson friends (and a pair of alt-orange Tennessee grads who possibly regret the error of their ways) the majority of the 20+ years since we graduated. Our biggest expedition was a 7 day cruise several years ago, for which we had 12 adults and 13 kids. This year a more modest sized bunch (9 adults, 6 kids) ventured to the southeastern capital of tourism, Orlando, FL. One might be tempted to say "sunny Orlando, FL," but the truth of it would be "sunny when not raining Orlando, FL." The youngest of the kids is 14, so the sight of mouse ears was never a consideration. 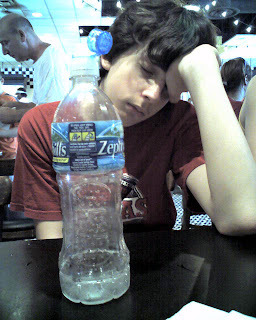 That 14 year old is Brian, my son, well known for his fondness of traipsing away from the computer/ TV/X-Box and rations of Hot Pockets in search of new adventures. Not! And he's particularly not fond of hot, humid places. His experience was better than this picture might suggest. He'll just never admit it. 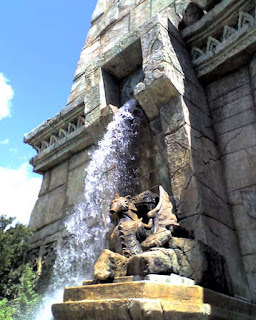 We spent two days at Universal Studios and one day at Typhoon Lagoon (a lame Disney water-park; Wet 'n Wild would have enthused the above, at least for a time). 1. You might be an engineer if... your three year old son asks why the sky is blue and you try to explain atmospheric absorption theory. You might be an engineer if... instead of talking about the rides at a theme park, you thoughtfully discuss the construction aspects while waiting in line. 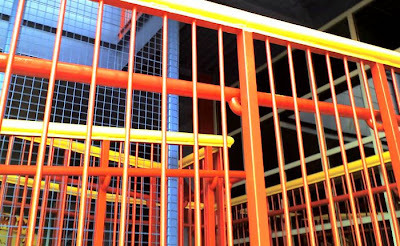 The new 4D Simpsons ride, for example, is a very well painted attraction - vibrant colors, thick coats of paint, straight edges where colors meet, undersides of surfaces painted, etc. Hmmm. Brushed? Sprayed? Stenciled? Pre-coated? How much did it cost? Were the components painted prior to assembly, or after? Ultimately, we agreed it was a mixture of both, but kudos to the crew - they paid attention to the details. Overall, Universal is a great park - spacious, colorful, ample fauna, fun rides (Hulk and The Mummy were favorites)... oh, and technically interesting! 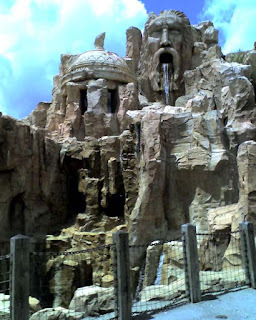 One of the older attractions (meaning, outdated and due to for replacement...) was The Lost Continent, and specifically "Poseidon's Fury." Having viewed a splendid moving holographic image of Christopher Walken at the "Disaster" attraction, we observed "old" technology projecting a war of gods on a curtain of water. 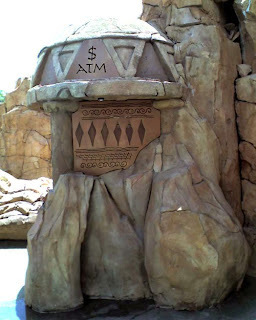 Engineering perspective: Does the attraction innovate the technology? Or does new technology innovate the attraction? Okay, I won't bore you further with that. Parks are very good at building to a theme. Below, there's even a restaurant with windows built into the façade. As might be surmised elsewhere, I think Henry Wadsworth Longfellow was correct when he said "music is the universal language." I must allow that "the West" adheres to a different perspective, proclaimed at the foot of these ancient ruins. Ca$h. There you go. Most take these altars for granted, but some apparently take them very seriously. There was the expected sign warning about alligators. We didn't risk life or limb. 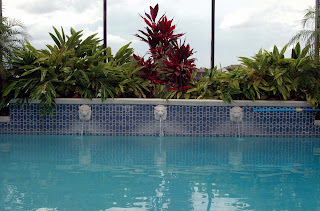 The mosquito-free enclosed pool was a quite sufficient water feature. The strange thing about this particular neighborhood, and apparently a good number of others, is that it largely is not a residential neighborhood. Yes.. huh? Only several houses had mail-boxes, and there was no personalization observed throughout the complex. 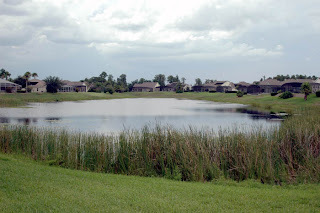 They're mostly built for investment via the rental income from Florida's cash crop, tourists. I'm not against the idea at all. If it works, that's great. It certainly served our purpose. But how strange would that be to live in a $1M home knowing 95% of your "neighbors" are only there for the week? Bizarre. 4. Friends are friends. Separated by distance and with relatively minimal communication through the year, we still click when we're together - it's always like old times, though the "old" is no longer entirely within the context of the phrase. With a packed fridge and pantry, and shoes and towels scattered around, it's enough to turn a very nice (but sterile) house into a home, if only for a week. We'll gather together again on New Year's Eve, when we'll celebrate at midnight with Coke Zero and yawns, after a day full of football, cards, Wii, Bananas, Knock, Texas Hold 'em and the other amusements for which this gang is known. Wow. You were down in my neck of the woods. Yep, thats right, I am one of those rare and exotic creatures - the native Floridian. *grin* Alot of the newer neighborhoods around Kissimmee are built specifically for the tourists. 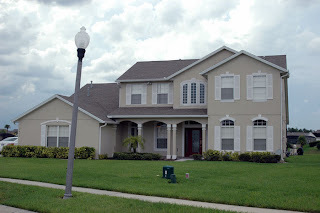 With so much to do in and around Orlando (and the quick drive to Tampa) they have targeted those communities for Renters - be they the family groups or the college kids on spring & summer breaks (or the ever popular snowbird). I hope you enjoyed your time here, there is just one question I need answered: Did you remember to take back a New Yorker under each arm? LOL. Sorry, its a Regional joke. Next time you come down, you should check out some of the smaller more intimate attractions such as Silver Springs with the glass bottomed boats and water park, Wild Waters, or even Weekie Wachee and its City of Mermaids.